You’ve likely heard the rumors that wherever the AMS Annual Meeting takes place, unusual and sometimes awful weather befalls that particular city. San Antonio, Texas, for example: AMS Annual has been there twice—in 1982 and 2007—and both times ice storms besieged the city, much to the dismay of residents and especially the city’s politicians. There’s nothing other than coincidence to this, of course; a convergence of meteorologists can no sooner conjure up furious tempests than AGU meeting attendees can deliver a mega disaster of geophysical proportions to their host city. But … as the 2016 AMS Annual Meeting draws to a close, the tropical record books are coincidentally being rewritten: Hurricane Pali had been whipping the Central Pacific near Hawaii for much of the week, and, now, another hurricane—named Alex— has formed in the Atlantic Ocean. In January! And a hurricane warning has been issued for the Azores Islands. Did we mention … it’s January!! It’s unprecedented: simultaneous tropical cyclones in the Atlantic and Pacific Oceans in the first month of the year. The average date of the first Atlantic named storm is July 9th. The first named storm in the Central Pacific also usually forms in July. Pali this year is not surprising—with one of the strongest El Ninos on record in full swing, the tropical Pacific is like bathwater. But an Atlantic hurricane? Forming in January, the middle month of winter? That’s happened only once in the 165-year Atlantic hurricane record. In 1938, an unnamed tropical storm formed way beyond the Lesser Antilles on January 3rd and became a hurricane on the 4th. The naming of Alex makes 2016 the second-earliest start to a hurricane season on record. Two other January tropical storms in the Atlantic were also “tailenders”—stragglers from the previous year’s season—but formed in December and then celebrated the new year at sea. Both Hurricane Alice of 1955* and Tropical Storm Zeta in 2005 formed on December 30th (*Alice was thought to have formed on Jan. 2, 1955, and although reanalysis determined it actually formed three days earlier, it’s in the records as the first storm of 1955 rather than the last storm of 1954) and lasted until January 7 (for Alice, that was 1955, and Zeta was in 2006). Zeta remained at sea west of the Cape Verde Islands, while Alice moved through the northern Leeward Islands with 80 mph winds before dissipating in the Caribbean. There were also two unnamed subtropical storms, in 1951 from January 4-9, and 1978 from January 18-23. Both churned the Atlantic northeast of Puerto Rico. So, how is a hurricane in the Atlantic possible now, this year? Are the waters still summer-like? At the time of this discussion, Alex was packing 85 mph sustained winds and had formed a distinct 20 nm eye within a ring of thunderstorms surrounding the center. 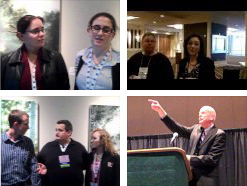 Did Alex form because a bevy of meteorologists converged at the AMS Annual Meeting in New Orleans this week? Fat chance! But stick around that host city a few more weeks and rumor has it you can experience Fat Tuesday—Mardi Gras in French. Good news: That rumor’s true!